Organic Pure care - Body and hair treatments inspired by nature. A range of unique, innovative body, skin and hair beauty products with balanced formulas based on precious organic plant extracts and essential oils. Organic Pure Care is a young, dynamic company made of a great team of professionals and specialists that are sensitive to market trends. Hence our team is on a constant search for innovation. The core mission is the protection and nourishment of hair and scalp. First of all by meeting the expectations of professionals who place high importance and value in natural ingredients, whilst also assuring excellent results in protecting the health of customers and stylists as well. Wellness Blend Treatments – biological and pure essential oils enriched with sweet almond oil, help treat scalp, hair and skin problems with the utmost care. Each blend treats specific problems with highly beneficial effects, they contain no artificial substances, no added fragrances – just natural essential oils extracted by cold pressing. A Professional Salon line based entirely on Natural Active Ingredients. In fact, what is considered “natural” is often based on chemical formulations with the addition of only a few natural ingredients. The Organic Pure Care is reversing this trend by creating a different kind of product. Organic Pure Care is the result of advanced research and innovative scientific technologies. Every single product in the range contains high synergistic concentrations of pure essential oils. These oils are extracted from plants and flowers according to ancient and traditional harvesting techniques. The precious healing properties, aromas and colours characterising each product, are preserved by extracting in the most natural way – in water. So due to this process the ingredients maintain their integrity, and health benefits and are not lost due to poor extraction methods. Consequently our ingredients are obtained using only completely natural methods, without the addition of harmful chemical additives. ORGANIC PURE CARE PRODUCTS ARE HIGH PERFORMANCE, WHILST CONTAINING ABSOLUTELY NO SLS, PARABENS, OR FORMALDEHYDE. A variety of active principles, in which the essential oils contained in the Blends and in the Organic Shampoos, detoxify the skin by removing external polluting agents, balance the hydrolipid film, and increase the natural production of keratin, and stimulate micro-circulation. The combined action of these products restore the PH of the scalp and get unprecedented results . Deep restructuring for your hair. 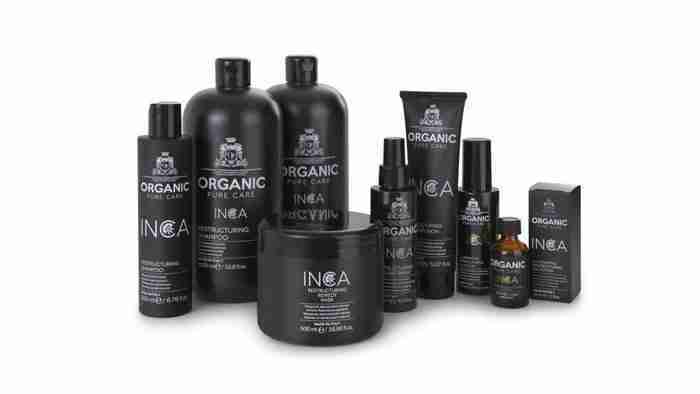 Organic Pure Care – Inca oil is a natural vegetable source of essential fatty acids containing Omega3, 6 and 9. Naturally rich in antioxidants, fat-soluble compounds found in nature (tocopherols), free radical reducing agents and natural Vitamin E. INCA oil ensures the maintenance of the right proportion of omegas in the hair fibre. Its rich and beneficial combination of omegas and Vitamin E and B have made it one of the most precious oils in the hair and beauty industry. Deep moisturising and hair as smooth as silk. Organic Pure Care – Silk Line line features Aloe extract in all its products. Since pure aloe vera gel and juice have a huge impact on our overall health, it’s not surprising that Aloe also promotes healthy hair and scalp. Silk Aloe Treatment allow the skin tissue and the hair to regenerate, promoting strong, healthy, shiny, groomed hair. Most noteworthy the soothing and eradicating of many skin and scalp problems. The benefits of Aloe for hair as a great conditioning agent are overwhelming. Organic Pure Care – Beauty line features a precious ingredient – Argan oil – also known as “liquid gold”. Argan oil is extremely rich in beneficial nutrients including fatty acids, and vitamin E. Its properties make it particularly beneficial for the hair and skin. Whilst creating your style – the vegetable oils contained in Organic Pure Care styling products repair hair fibers by hydrating, regenerating, strengthening, protecting and adding shine, without weighing it down . A number of our styling and finishing products are heat and and UVA -UVB protectors. An added bonus to stylists – our styling products are completely inter-mixable to totally dial up the individual style for your clients.